Eudemonic sought out to refresh their web presence, asking Rolled to step in and make this happen. Collaborating with Richard Ardagh of Elephant’s Graveyard, we worked together to get their new look up and running as quickly and painlessly as possible. 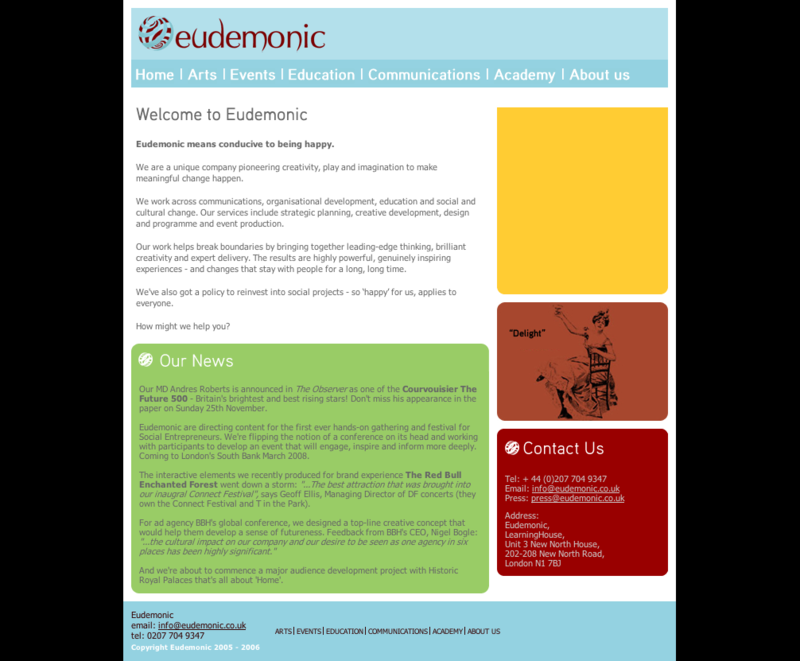 Eudemonic is an agency for creative change, learning and communications. We work across organisational development, social & cultural projects, education and events. Our stand of artistic projects are about adding a bit of playful sparkle to everyday life. We are delighted that in less than a very short time we’re making an amazing difference to how organisations, communities and individuals grow. We are delighted with the speed, professionalism and support offered by the folks at Rolled. I’ve already asked them to help on a second project and our new site is barely up. We are happy we helped in taking Eudemonic’s work further. We look forward to working with Andres, Lizzie Ostrom and the rest of the Eudemonic team in future projects.